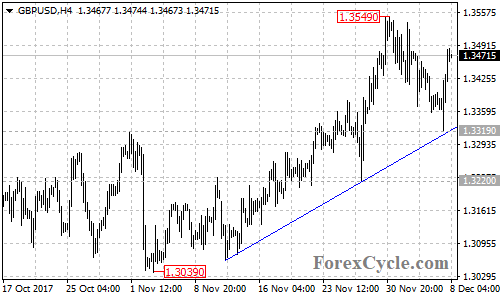 The GBPUSD pair failed in it attempt to break below the bullish support trend line on the 4-hour chart and rebounded strongly from 1.3319, suggesting that the pair remains in the uptrend from 1.3039. As long as the price is above the trend line, the price action from 1.3549 could be treated as consolidation of the uptrend. Further rise to test 1.3549 resistance would likely be seen after the consolidation, and a breakout of this level will indicate that the uptrend has resumed, then next target would be at 1.3657 (Sep 20 high). On the downside, a breakdown below 1.3319 support will confirm that the uptrend had completed at 1.3549 already, then deeper decline to next support level at 1.3220 could be seen. Below this level could trigger further downside movement towards 1.3027 (Oct 6 low).